You’ve probably heard of the term search engine optimization, or SEO for short. 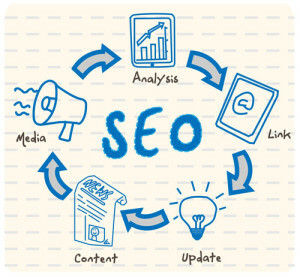 This basically refers to the process of getting your website ranked as high as possible in the search engines. In other words, when a prospect, student, faculty member or alumni Googles schools like yours, SEO will ensure that your higher education institution appears as high up in the list of results as possible. To follow are a few helpful tips to ensure that your site is performing to its greatest potential. Fresh, Quality Content Matters – It used to be that SEO meant cramming as many keywords into your content as possible. These days, search engines care more about the quality of the content you’re producing than the number of keywords you use. Producing and publishing fresh content is also an important component of the ranking algorithm, which is why blogs are so valuable. Links Are Important – Including links to other high-quality, relevant websites throughout your content can really boost how your site performs in the search engines. Likewise, links that come back into your site from other areas of the web are equally valuable. Social Media Counts – How active your higher education institution is on the various social channels can also have an impact on how your site ranks in web searches. That’s because it helps lend credence to your school’s authority in the education realm. Make it easy for people to interact with and share your content by including social sharing buttons on your site, your blog posts and anywhere else you can think of. Mobile-Friendly is Essential – We recently shared information about how Google is now penalizing websites that aren’t mobile-friendly, or easily accessed and viewed on any smartphone, tablet or other mobile device. This important new rule plays a role in SEO, so be certain your site meets the requirements (you can test it here). Search engines are responsible for driving more than a third (38%) of all traffic to higher education websites. Therefore, it goes without saying how important it is that your college or university rank well. Otherwise, you risk losing valuable prospects to other more web-savvy schools. By applying the tips listed above, you can optimize your site’s performance and improve the chances of being found the first time, every time!